It's no secret that I love animals. You must love them too if you are on this site! 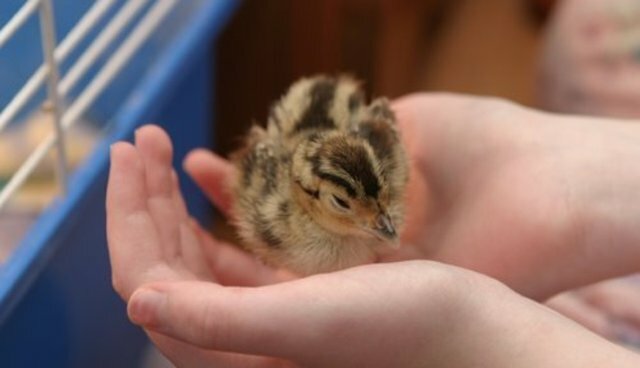 So what would you do if you saw a pheasant chick about to be thrown in a garbage can and left to die? I had stopped by a farm supply shop years ago to get alfalfa for my bunny. This supply shop was new to me, and I did not know they had eggs and chicks there. I saw newly hatched chicks under a big heater and had to investigate further! I didn't know what kind of bird they were, but I enjoyed watching them. I was disturbed by one chick who appeared to be picked on. The others were pecking at it and leaving cuts on its' neck. Must be the runt. I asked the farmer about it and he said that the little guy was going to be "tossed" that night since he wouldn't survive like the others. I asked what that meant, and he pointed to the big garbage can in the corner. This dilemma was not one I expected to have this day! I asked the farmer if I could have the runt chick. He laughed at me and quickly said no. I told him that it was just going to die anyhow, so please let me try to keep him comfortable. He wasn't too friendly about it and was quite possibly very judgmental about me and my request, but I didn't care what he thought about me. I just wanted that chick to be warm and safe for whatever time he had left. The farmer got out a brown sandwich bag. He scooped up the chick and put him in the bottom, rolled down the bag to form a handle for me, and gave me the bag. YES!!!! 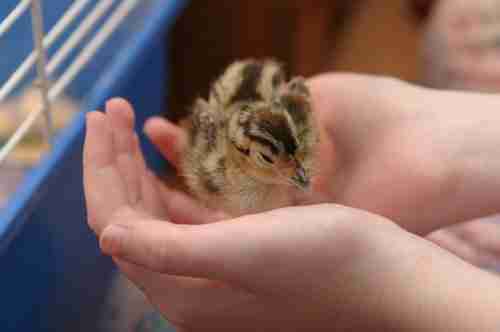 He told me it was a pheasant chick and should last about another two hours or so. I took my pheasant-to-go bag and raced home. At home, I immediately set up a large bunny cage I had and placed a heat lamp on top. I lined it with newspapers and then a layer of pine chips. I had purchased a bird waterer and put that in place. Seeds and a little box for a bed also went in. I placed the cut up little baby pheasant it his new home and let him settle in. Two hours to live? This was a much nicer way to go. Baby pheasant must have liked his home. Two hours turned into days and then weeks and then months. We had fun feeding him and watching him outgrown each set up we made. Soon, his back tail feathers started to grow in and he was looking like he came straight out of a painting! I understand that one is not supposed to have this kind of bird on their property, yet I hadn't imagined he'd live, let alone become strong, healthy and BIG! It was time for a new home. I knew of a gorgeous farm that happened to have rescued animals on their property. I discussed this pheasant boy with them and found out that they had a large bird enclosure for rescued wild birds! 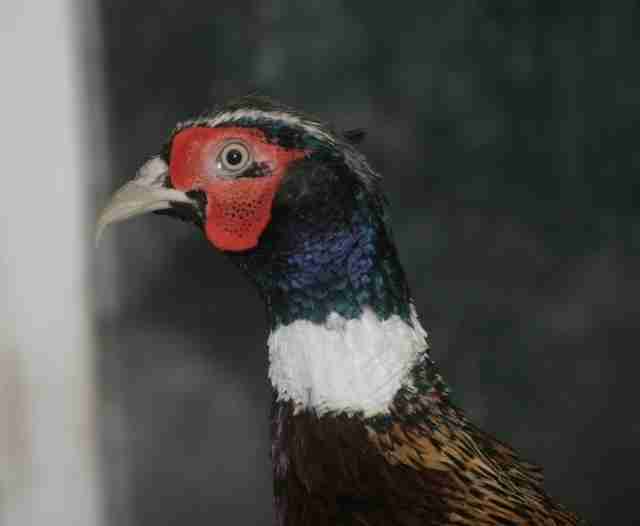 Not only that, but they also already had a pheasant ... a girl who had lost her mate awhile back. Not only does our boy get a new home, but possibly a new girlfriend too! I dropped him off at the farm, and watched as we released him into the bird enclosure. I was so worried there would be a fight, but all went so well as the birds checked him out. The girl pheasant came over and eventually did a little dance around him. The farmer owner laughed and said that she was "showing off" for him! It was sad to leave him, but he is so well taken care of now that I cannot feel anything but thrilled about it. Despite the criticisms I heard such as,"You're not saving the world!" and "That's crazy!" and even more than you can imagine, I am so happy I asked to take him. He did not die a slow death in a garbage can. He lived.